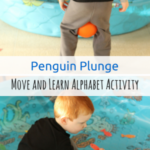 This alphabet relay obstacle course for preschoolers is an exciting way to learn letters while moving and playing this summer! It’s super easy to make too! This was a HUGE hit with Evan! He did not want to stop running through the obstacle course. 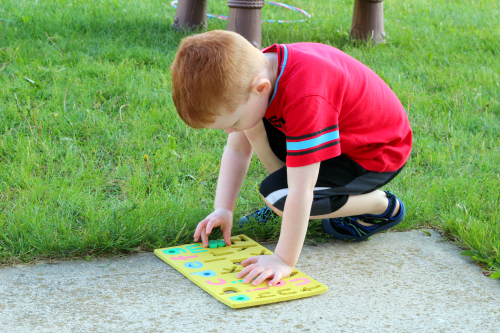 It was tons of fun, great exercise, excellent for gross motor development and highly effective practice with letter identification! He even had the chance to develop critical thinking skills. 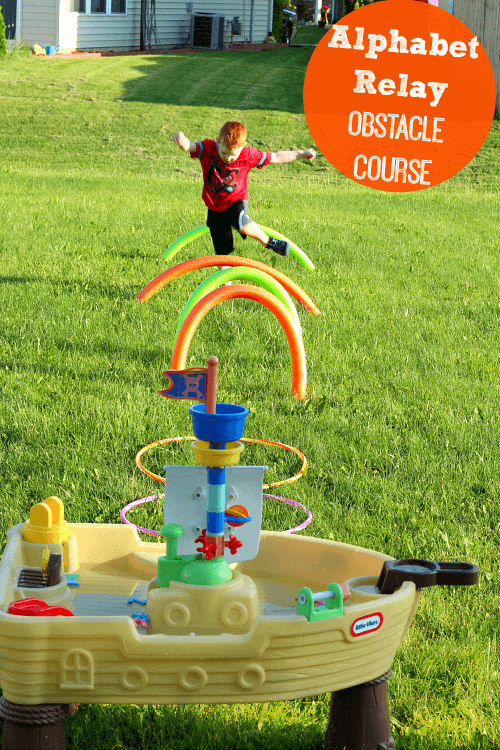 Making the obstacle course was so easy! Trust me. I had to move it twice because of logistical problems. It only took me a couple of minutes to set it up each time. It is also very affordable and many of the supplies can be utilized in various ways all summer long and beyond! 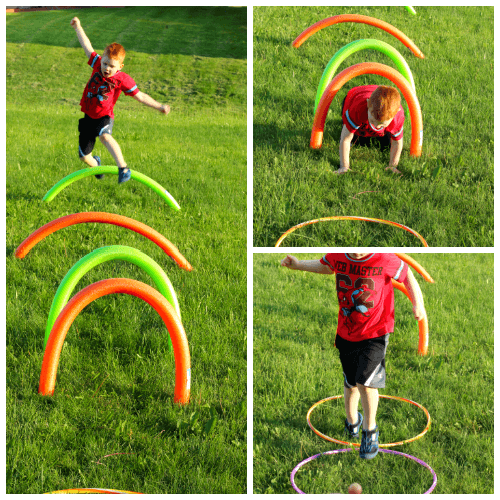 I got everything I needed to make the obstacle course for $8 at the dollar store. If you don’t have a water table, you can just put the letters in a bucket or bin. 1. To make the pool noodle arches you will need to stick the ball point pens in the ground. 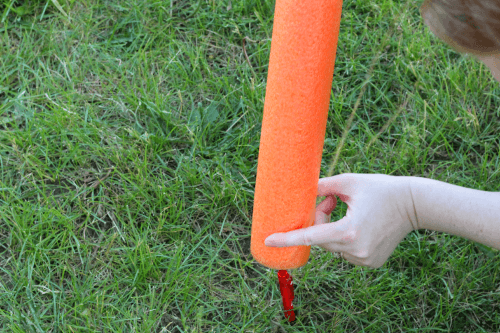 Then place the ends of the pool noodle over them so that the pen slides into the hole in the pool noodle. I made two low arches for jumping over and two high arches for climbing under. 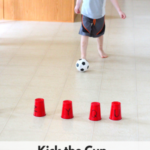 Make sure to space them out enough so that your child can get a running start before jumping each arch. 2. Then lay your hula hoops in a row. 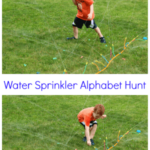 Your child will jump in each one on their way to the water table. You could add a 4th hula hoop and place them 2 by 2. Then run through them like those tire courses. We plan on doing this next time! 3. Remove the foam letters from the puzzle or grab your bath letters and throw them in the water table. 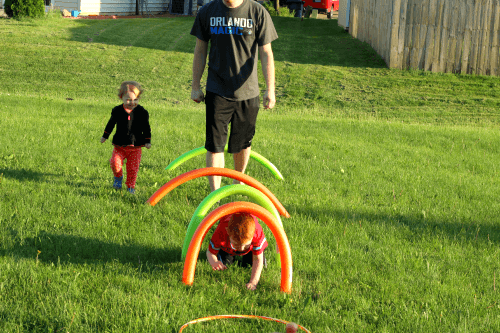 I led Evan through the obstacle course and explained each step to him. Then I let him practice a couple of times. Finally, it was time to start the relay! Evan started in front of the low arches and ran through each part of the course. His favorite part was jumping over the hurdles! 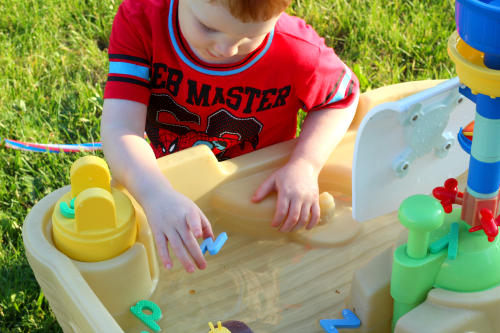 As he was getting to the water table, I called out a letter and he searched for it in the water table. 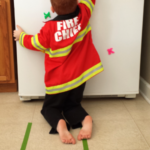 Originally, I planned to have him run the letter back to the start of the obstacle course, but we decided to have him put it back in the puzzle board. This added an additional aspect of critical thinking, which was awesome! Eventually, he and my husband decided to race through the course together, grab a letter and get it in the puzzle. This added an element of competition and Evan loved that! 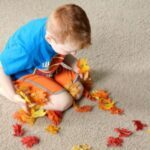 This was such a fun summer move and learn activity for Evan. He keeps asking me to set it up again. I really like that we can change the course up each time and use the supplies to do other summer learning activities too! 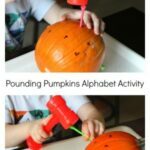 Here are some more summer alphabet activities I think you will enjoy! 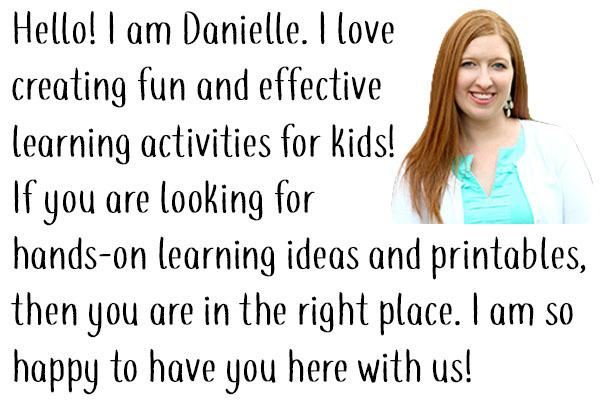 Check out all of the other summer fun and learning from our friends!